Mercy turns in active compassion. There is a story written by Dan Clark called Puppies for Sale. It goes like this. A store owner was tacking a sign above his door that read "Puppies For Sale." Signs like that have a way of attracting small children, and sure enough, a little boy appeared under the store owner's sign. "How much are you going to sell the puppies for?" He asked. The store owner replied, "Anywhere from $30 to $50." The store owner smiled and whistled and out of the kennel came Lady, who ran down the aisle of his store followed by five teeny, tiny balls of fur. One puppy was lagging considerably behind. Immediately the little boy singled out the lagging, limping puppy and said, "What's wrong with that little dog?" The store owner explained that the veterinarian had examined the little puppy and had discovered it didn't have a hip socket. It would always limp. It would always be lame. The little boy became excited. "That is the little puppy that I want to buy." To this, the little boy reached down and rolled up his pant leg to reveal a badly twisted, crippled left leg supported by a big metal brace. He looked up at the store owner and softly replied, "Well, I don't run so well myself, and the little puppy will need someone who understands!" The person who possesses the gift of mercy has the ability to genuinely empathize with an individual who is suffering. The gift enables the possessor the ability to demonstrate compassion in a way that reflects the glory of God and strengthens the sufferer. We live in a 24-hour news cycle. Tornado ravaged towns, flooded communities, subdivisions completely destroyed by wildfires; earthquakes shatter the lives of entire countries. Tsunamis wiping out villages, droughts destroying crops, and the list go on. If there is ever a time for the gifted in mercy to stand and be usable for God is now. There are millions of hurting people in the world; but also in the very communities in which you live and the churches in which you gather. There are countless stories of friends, neighbors, co-workers and church members who have heart-wrenching stories of sorrow, pain, and disappointment. The Parable of the Good Samaritan is about a guy who lays aside all social codes of ethnicity for the sake of taking care of his neighbor. Our society is filled with the sting of divorce, the pains of abuse, the struggles of HIV-AIDS, the toll that alcoholism has on families, the loneliness that leads to depression, and many other problems. We do not have to look very far or very long before we can spot someone in need of the gift of mercy. Compassion is mercy in action. Mercy is the Spirit working gift that demonstrates God's sincere compassion on others who suffer. 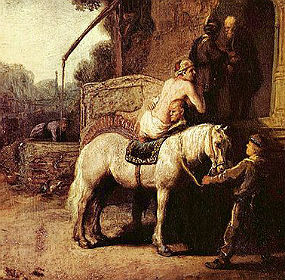 The parable of the Good Samaritan (Luke 10:25-37) is a spiritual message of love for neighbor, being an honorable citizen, and demonstrating mercy the extra mile. The Samaritan also demonstrates spirituality and not religion. Spirituality is being Christ-like in action. Religion is a belief or an opinion about theology. It is obvious that the Samaritan wasn't concerned about the wounded man's theology, but rather about taking care of his needs. The religious men could not see outside their tunnel vision and take the time to demonstrate mercy. What do you see in the very people God places right in front of you? "The Gift of Sympathizing Mercy" by Brian McCutchen is licensed under a Creative Commons License. Heartlight encourages you to share this material with others in church bulletins, personal emails, and other non-commercial uses. Please see our Usage Guidelines for more information.